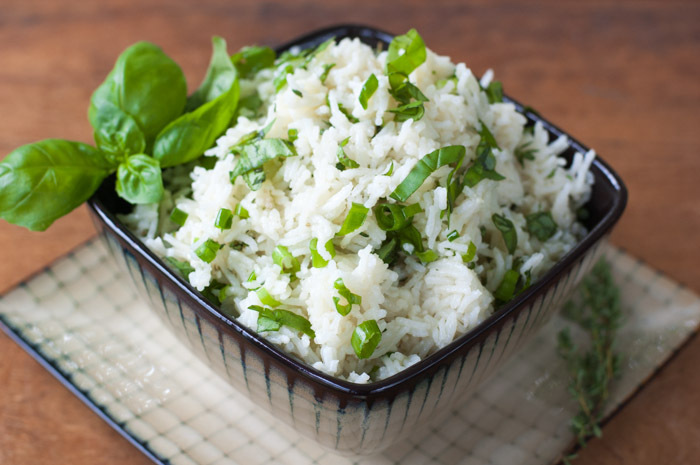 This rice great for using up leftover rice and will go well with meat, fish or chicken. Ingredients such as peas, different types of herbs, nuts, etc. can be added as well. Toss the hot cooked rice with the flavouring ingredients and keep warm until ready to serve. A basic version of the ever popular Japanese delight. For best results, sushi should be assembled shortly before serving. Refrigerate after making and use within a few hours if raw fish is used or a day if cooked crab sticks or smoked salmon or trout was used. For those who do not enjoy the seaweed or Nori wrappers, turn the ingredients into a delicious cold salad or cooked vegetable sushi salad – see variations below. Place the rice into a saucepan, cover with water and soak a few minutes. Stir with the fingers and drain. Add the 375ml water and salt and bring to boil. Reduce the heat to simmering, cover with a tight fitting lid and simmer about 15 minutes or until all the water has been absorbed. Place a clean kitchen cloth over the saucepan, cover tightly with the lid and allow to stand 15 minutes to complete steaming. To make the egg pancake, beat the eggs in a cup. Combine the castor sugar, salt and flour in a small jug and, using a whisk, beat in the egg. Beat together very well until smooth. Heat the oil in a small, preferably non-stick shallow pan and add the egg mixture. Cook over gentle heat until set, loosen carefully, turn over and cook briefly on the other side. Turn out, cool and cut into strips. Mix the castor sugar and rice vinegar in a small jug to allow the sugar to melt. Turn out the rice into a wide shallow dish to allow quick cooling and sprinkle the vinegar mixture over the rice. Separate the grains with a knife or fork while the rice is cooling. Cover with a cloth until ready to use. Pour a little vinegar into a small dish to moisten the fingers while working. Lay out the bamboo mat or perforated cloth onto the work surface and place a sheet of nori, coarse side upwards onto the mat. Dip a spoon into the rice vinegar and spoon and spread about 100 ml of the cooked rice onto the nori, covering the width completely but allowing 2cm at the bottom edge and 5cm mm at the top edge uncovered. Arrange strips of filling ingredients in a neat, tight line horizontally across the centre of the rice. Spread a little wasabi over the filling for flavour if preferred. Moisten the top edge of the nori with a little vinegar and using the mat or kitchen cloth, roll up the sushi away from you, pressing and rolling as you go, making a firm neat roll surrounded by the mat or cloth. Repeat the process until all the rolls have been made, cover the rolls for at least 10 minutes with a damp cloth to set and seal and refrigerate immediately. When ready to serve, cut the sushi rolls into 6 – 12 sections and place the rolls on their cut sides onto a serving plate with a small bowl of soy sauce or the wasabi mixture in the centre for dipping. 24 – 48 sections, depending on the thickness of the slices. 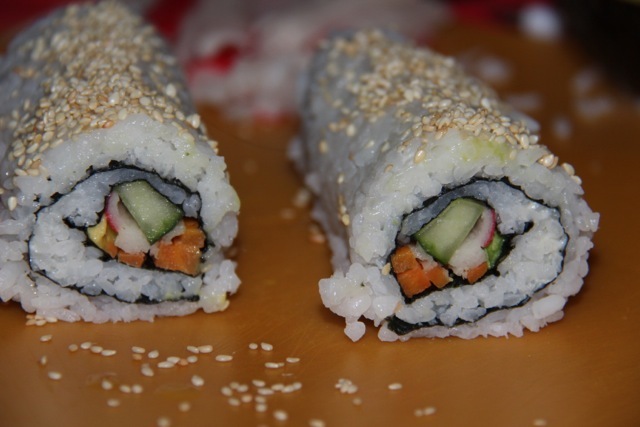 Vegetarian sushi – make delicious sushi with vegetable ingredients only. Cold sushi salad – omit the Nori and rolling and toss together all the ingredients to serve as a salad. Garnish with diagonally snipped spring onion if preferred. Hot sushi salad – see below. Cut the vegetables into strips or dice and toss with the marinade. Roast for 20 minutes at 200 ºC. Toss with rice and egg pancake and serve with pickled ginger, wasabi and soy sauce. Recipe by Carolié de Koster from her Bon Appetite & Goodbye Demonstration. Meatless meals need not be without texture, taste or excellent nourishment. Serve this bobotie as the main dish with nutty brown rice and colourful vegetables or salad. Leftovers will step in well as a side dish with meat or fish. Also see the traditional Bobotie recipe. Sauté the onion, tomato, banana and apple in the oil for 5 minutes. Pour the milk over the bread to soak while sautéing. Add all the remaining ingredients and stir to combine evenly. Transfer the mixture to an ovenproof dish of a suitable size and smooth the top. Set the oven at 180 º C and bake the bobotie for 20 minutes. Beat together the eggs and milk and pour over the bobotie. Arrange the leaves on top decoratively and continue baking for another 20 minutes until the topping becomes attractively golden brown and set. Serve with Yellow Brown Rice & Raisins. 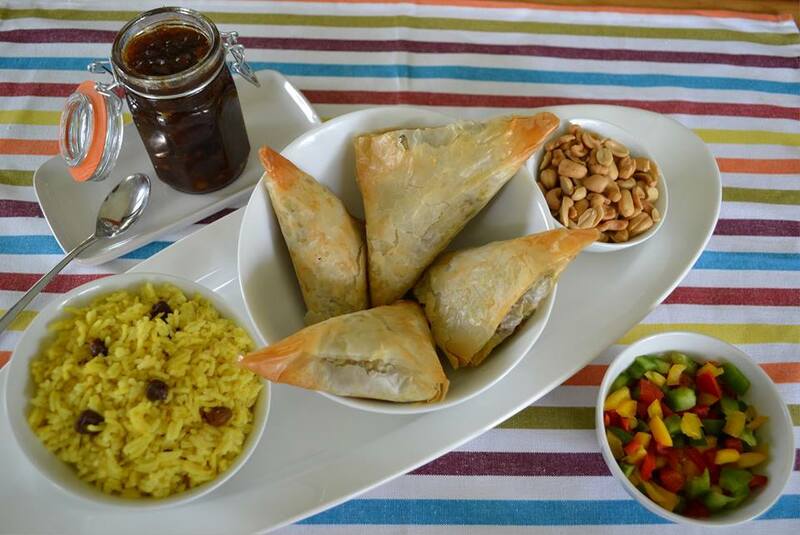 Leftover Bobotie can be used as a filling for Phyllo Triangles. Turmeric, widely used in Cape Malay cooking, colours and flavours the rice. Raisins add texture and sweetness while the cinnamon stick creates a mysterious aroma to the rice. Brown rice is recommend but white rice may also be used. Place the rice in a saucepan and cover with the boiling water. Allow to soak at least an hour. Rinse the rice with the soaking water and drain. Add all the remaining ingredients to the saucepan and bring to boil. Turn down the heat, cover partly and allow to simmer gently for about 30 minutes or longer if necessary until the rice is tender to taste and dry. Remove the cinnamon stick, fluff lightly with a fork and serve hot. Soaking brown rice not only shortens the cooking time but softens the outer husk to make the rice deliciously palatable. 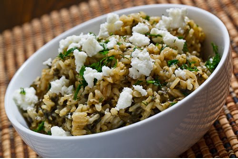 Spinach and rice is a surprisingly good combination and stems from the Greek cuisine. Fresh, young spinach and a special flavourful rice e.g. short grain white or brown Basmati rice will make a good dish even better. Serve with any roast or stewed meat, especially lamb or chicken, as a border to surround a joint of meat, slices or portions. Place the oil, butter or margarine, spring onion and/or leek and garlic or garlic and herb seasoning into a saucepan and saute very gently while stirring for 2 – 3 minutes or until softened. Add the rice and saute 2 minutes more while stirring. Add the water, chicken stock powder, salt and dill if used and bring to boil. Reduce heat, cover partly and simmer gently for about 20 minutes or until the rice is tender and dry. In the meantime, wash and drain the spinach well and break out any hard stems. Place the spinach into a saucepan and simmer gently for a few minutes until just limp or place into a bowl, cover and microwave on HIGH for a few minutes or until just limp. Drain the spinach well in a colander, chop coarsely by hand or very briefly in a food processor and add to the cooked rice together with the parsley and salt and pepper to taste. Spoon into a suitable dish for serving and keep warm. Serve as is or sprinkle with a layer of crumbled Feta cheese or Parmesan cheese if preferred. 6 to 8 generous servings. Recipe by Carolié de Koster from the Art Of Cooking Recipe Book p. 439. Tabbouleh is a Middle-Eastern salad that is traditionally made with bulgur wheat and a combination of tomatoes, cucumbers, onion, finely chopped parsley, mint and garlic and seasoned with olive oil, lemon juice, and salt. The bulgar wheat can be substituted with quinoa, pearl barley or couscous for equally good results (see notes below). Quinoa (pronounced keen-wah) is often thought to be a grain because of it’s cooking characteristics, but it is actually a seed and therefore gluten-free. The protein in quinoa is considered to be a complete protein due to the presence of all 8 essential amino acids. Quinoa is used as a grain and substituted for grains such as bulgur wheat, pearl barley or couscous. See notes below. To make the quinoa, measure the quinoa with a 250 ml measuring cup and transfer it to a sieve or fine-mesh strainer. Rinse it very well under running water while rubbing the quinoa between your fingers (see notes). Drain and transfer the quinoa to a saucepan and toast for a few minutes on medium heat until there is no liquid left. Add the water and stock powder and bring to a boil. Lower heat and cook covered for 15 minutes. Remove the saucepan from the heat and let it stand covered for 5 minutes. Fluff the quinoa with a fork. It should be transparent and you should see tiny spirals (the germ) curling around the quinoa seeds. See photo below. Transfer the quinoa to a large plate to speed up the cooling process. Prepare the salad ingredients, add the chicken and transfer it to large mixing bowl. Combine the ingredients for the dressing in a small mixing bowl and whisk to combine. Pour the dressing over the salad ingredients in the bowl and mix well. Add quinoa to taste – between 250 ml and 500 ml and mix well. Cover the bowl with the lid or cling wrap and chill for at least 1 hour or overnight in the fridge to allow the flavors to blend. When ready to serve, transfer the salad to a salad bowl and serve. Rinsing the quinoa removes its natural coating, called saponin, which can make it taste bitter or soapy. One cup of dried quinoa yields about 3 cups cooked. 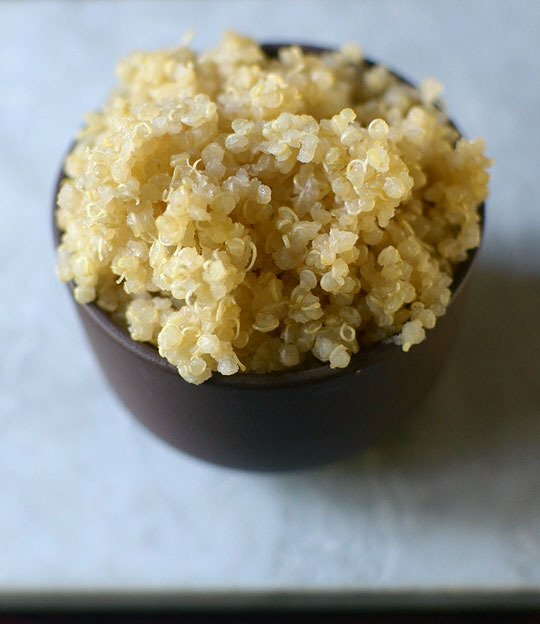 Cooked quinoa can also be used as the basis for pilafs, salads, breakfast porridges, desserts, etc. 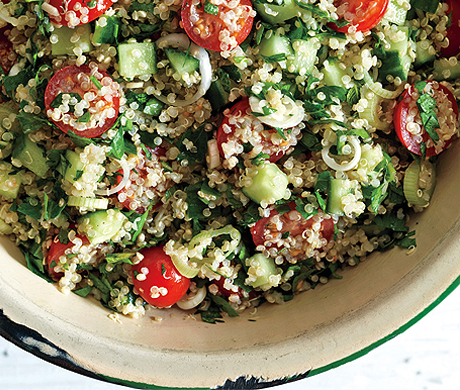 Pearl barley, bulgar wheat or couscous can be used instead of quinoa. Pearl barley is barley processed to remove its hull and bran. Although pearl barley is not a wheat product, it does contain gluten. To cook the pearl barley, measure 250 ml pearly barley into a medium saucepan and add 4 cups (1 liter) cold water and 2.5 ml salt or stock powder. Bring it to the boil, turn it down to a simmer and cook for 15 to 20 minutes or until soft. Be careful not to overcook it, as it will become soft and mushy. Drain any excess water and transfer the cooked pearl barley to a large plate and set it aside to cool before mixing it with the salad ingredients. Bulgur wheat is a whole wheat grain that has been cracked and partially pre-cooked. Bulgur wheat is high in fiber and low in fat. To cook bulgur wheat, bring 500 ml water to a boil in a medium saucepan and add 250 ml bulgur wheat and 2.5 ml salt or stock powder. Bring it to the boil, turn it down to a simmer and cook for 15 minutes until soft. Couscous is made from durum wheat semolina. Couscous is therefore not gluten free. To cook couscous, measure 250 ml boiling water with a measuring jug and add 10 ml olive oil and 2.5 ml stock powder of your choice. Pour the liquid into a mixing bowl and add 250 g couscous. Mix well, cover with cling wrap or a lid and set aside for 5 minutes. Fluff the couscous with a fork to ensure that there are no lumps and serve as the starch of a meal. Rice plays an important part in Italian cuisine and each region has it’s own risotto recipe made with Arborio or risotto rice or if not available, short grain or any other kind of rice. 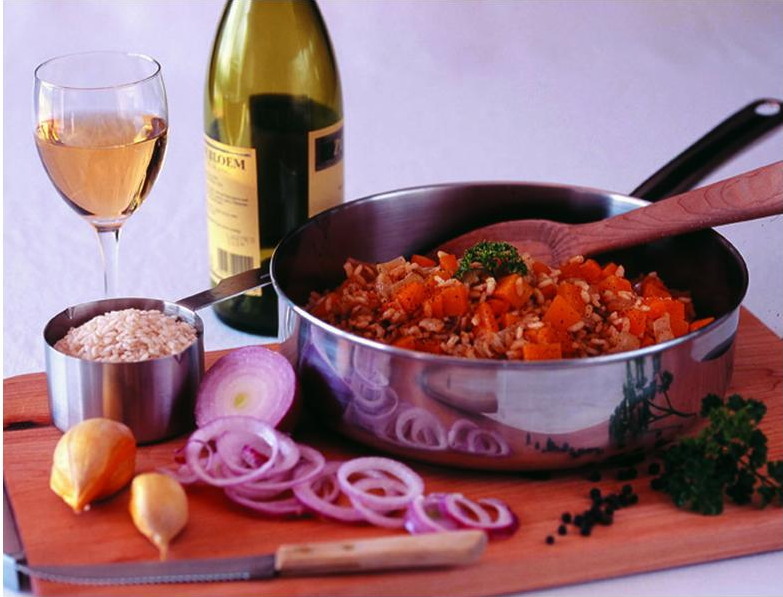 Below are recipes for a Butternut as well as a Seafood Risotto. Serve with any meat dish or on it’s own as a vegetarian main course. If Arborio or white rice is used, rinse in cold water to remove the starch. Heat the butter or margarine and oil and sauye the onion, ginger, garlic for 3–4 minutes until tender. Add the rice and saute 5 minutes more whie stirring from tiem to time. Add the wine, water, stock powder and salt and bring to boil. Boil uncovered for 5 minutes, reduce the heat and simmer 5 minutes more. Place the butternut on top, cover and simmer about 20 minutes until the butternut is cooked and the rice is almost dry. Add the black pepper and mix lightly . Serve with Parmesan cheese. 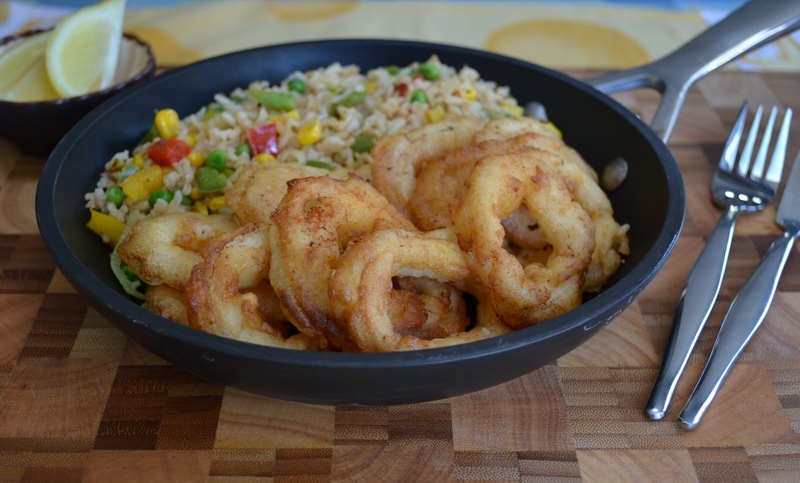 An astounding combination with rice and seafood! Sauté the onion and garlic in the oil for 5 minutes. Add the rice and stir to combine. Add all the ingredients except the marinara mix and bring to boil. Stir and turn down the heat. Simmer partly covered until almost but not quite dry – risotto should remain slightly moist. Stir from time to time while cooking. Add the seafood, mix lightly to combine and adjust seasoning. Use additional or different kinds of seafood such as prawns only or any combination.